St Kilda win by 25 points and can still play finals. Riewoldt is back at the ground after having scans on his knee and is looking relieved and the Dees kick 8.1 in the final term, good news all round. GOAL DEMONSSylvia marks on the siren and guides home the goal to deliver Melbourne's best term of the season 8.1. GOAL SAINTSSaad marks 35 out right in front and after we endure his slow motion 'walk up' he kicks the goal. GOAL DEMONSSellar marks and kicks his second in succession as the Demons go on a late game goal spree, the Saints' have slowed to a crawl however the Dees won't be able to bridge the gap. GOAL DEMONSJetta with courage holds onto the ball until the last second when he goes over the top to Sellar who boots yet another Melbourne goal. GOAL DEMONSGreen marks wide between the pocket and the flank, with only a sliver of goal visible he threads the needle for his first of the afternoon. GOAL DEMONSBlease kicks his fourth goal and while it is impossible for the Dees to steal a victory in this match at least they are going down swinging. GOAL SAINTSGoddard puts the ton on the board for the Saints as he kicks another goal. GOAL DEMONSWhile Wilkes puts on a demonstration at one end Blease has kicked a career best of three at the other, this time courtesy of a lovely pass from Trengove. GOAL SAINTSCripps kicks his second of the afternoon and the Saints lead by 55 points, right now it is just a question of 'Saints how far'. GOAL DEMONSJetta hasn't kicked a goal this season, that's all about to change as he lines up from 40 out and slams home the Dees' fifth. BEHIND DEMONSGrimes trying to lift his side gathers outside the arc, dashes to 40 out before kicking across the face of goal for a point. GOAL SAINTSSt Kilda continue to tick the scoreboard over as Wilkes kicks goal number five, he ran his man under the ball before he doubled back and took a great mark. 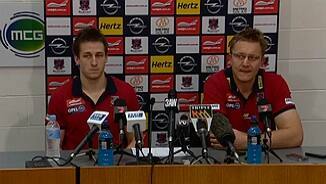 SUB MELBOURNEMagner gets his chance to do something and add some spark as Moloney is subbed out. St Kilda all but sealed the game in that term as they put on six unanswered goals, that was St Kilda's best quarter of the season. GOAL SAINTSKoschitzke with a kick after the siren puts the Saints 50 points in front and Melbourne in a very bad place, especially after they played so early in the match. GOAL SAINTSSteven with a running goal puts some serious hurt on the Dees as he stretches the lead to 44 points. GOAL SAINTSWilkes has his fourth goal after he marked 65 out and was taken high and with the resulting 50 metre penalty he was never going to miss. GOAL SAINTSCripps out distances his man as he runs back towards goal...he takes the ball in space and running into an open goal drives it through. BEHIND DEMONSMaconald marks just inside the arc, he takes on his man and dances around him before taking the long shot...the ball went and through for a point. GOAL SAINTSWilkes kicks his third of the match and suddenly the Saints are out to their largest lead of the match. BEHIND SAINTSGoddard from 50 out has a shot from wide on the flank...the ball starts wide and stays there! BEHIND SAINTSMilne with eyes only for the goals ignores at least two open players to try and kick it himself, the ball is off line and through for yet another minor score. Blease at full pace tries to kick across his body and lob a goal through from 15 out, right in front, he miskicks the ball and misses everything. GOAL SAINTSMilne working tirelessly leads yet again and this time it is not ignored. Milne lines up from 35 out on the merest of angles slots it home and the Saints lead by three goals. BEHIND SAINTSSt Kilda has had the ball bottled up in the attacking fifty for the last few minutes finally Melbourne concede the behind through Rivers to relieve the pressure. GOAL SAINTSWilkes marks strongly and from the set shot goals. That is only St Kilda's second goal since quarter time and was much needed, the margin creeps out to eleven points. BEHIND SAINTSGoddard, under pressure is forced to take a hurried shot around his body, he curls the ball too far is it flies wide for a behind. GOAL DEMONSBlease running into the goal square, he puts on a burst of speed outpaces his opponents, and kicks the ball off the ground for his second goal. BEHIND DEMONSA ball up in the Demons' goal square results in another rushed behind. St Kilda lead by 10 points. BEHIND SAINTSDal Santo with a hurried snap on goal sprays the ball wide for a St Kilda behind. GOAL DEMONSDunn from the pocket drops the ball onto his right boot and attempts to banana the ball through, it bounces through 5 players and through for a miraculous opening goal. News on Riewoldt is that he has left the G to go and have scans on his right knee, which wasn't strapped or iced after he injured it...make of it what you will. That was a much better half for Melbourne who finally found the big sticks, however St Kilda struggled without Riewoldt not scoring until the dying minutes of the term. Tapscott marks as the siren sounds, he is 50 metres out but will have a shot anyway, the ball falls short and is punched clear. BEHIND SAINTSKoschitzke takes a strong grab a centre half forward but cannot convert the set shot, pushing it wide as he strives for distance. GOAL SAINTSWilkes marks deep in the pocket and is gifted a goal as Strauss gives away a 50 metre penalty 15 out from goal. GOAL DEMONSSt Kilda have stopped and the Dees have found another gear, after waiting almost two quarters for a goal Blease give them their second in a matter of minutes. BEHIND DEMONSThe ball is thumped through for a rushed behind, there was no-one to fly for the Demons. BEHIND SAINTSSaad off balance has a hurried shot on goal, the ball is high and wide for a behind. GOAL DEMONSHowe sharks the ball out of the ruck - deep in the forward pocket, he takes a couple of steps and then guides it through for the Dees opening goal, not of the term, of the match. It is interesting to note that since Riewoldt went off the Saints haven't scored a goal. Melbourne have had plenty of the ball, in fact they lead the Saints 2016 in inside 50's however they simply cannot make the score board tick over. 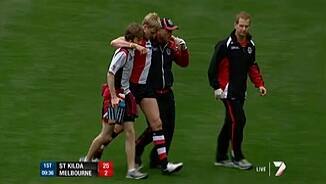 Riewoldt is on the bench, wearing the red vest and using crutches to hobble around. BEHIND SAINTSAnother point to the Saints as the Melbourne backs concede another rushed behind. BEHIND DEMONSMelbourne cannot buy a goal as Jones steals the ball away from the Saints and then sets sail for goal only to see his kick bounce short and go the wrong side of the post. BEHIND DEMONSHowe pulls down what for him is a regulation mark, as he floats across the face of the pack and pull down a beauty...his kick does not do justice to the grab...one behind. Jetta tucked up deep in the pocket tries to throw the ball onto his boot and screw it through for a goal...it hits the behind post, free kick St Kilda. 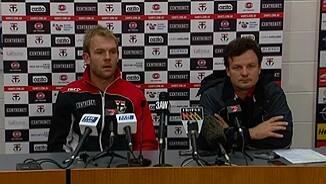 The Sub's vest has come off Ledger, that of course means that Riewoldt's day is over. The siren sounds and the Dees find themselves goalless once again, their second successive quarter against the Saints, St Kilda were just too slick for the hapless Melbourne. BEHIND DEMONSGreen leads to the flank and is rewarded with a pinpoint pass, however his kick is off line for a behind. Melbourne are over possessing the ball while they try to manufacture some sort of forward entry, with a relatively small forward line they don't seem to have anywhere to go. 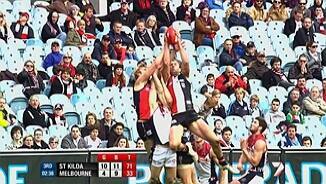 BEHIND SAINTSThe St Kilda onslaught continues as Milne pushes a kick across the face for a minor score. Melbourne blow another chance to score as the skipper kicks into the man on the mark while attempting a set shot from 40 out. Riewoldt went straight down into the rooms, it looked as if he may have hyperextended his right knee and he attempted to mark a low ball. The Dees had a chance to score as the Riewoldt drama unfolded, however their long bomb forward fell amidst a cluster of Saints' jumpers and was easily marked and cleared. Riewoldt is hobbling badly at half forward...surrounded by a cluster of trainers...it is not looking good as he is assisted off by a couple of trainers. GOAL SAINTSRiewoldt kicks long looking for Koschitzke, whose opponent Sellar looked to have taken the mark, only to spill it. Koschitzke recovers quickly and snaps around Sellar for a goal. BEHIND DEMONSA long shot on goal is helped over the line by the Saints' defence. GOAL SAINTSSaad with a behind - after a comedy of errors sees the Saints' make a meal of what looked to be a simple forward movement, however he was tackled on the kick and on the do-over goals. GOAL SAINTSRiewoldt leads into the pocket and presents a target his teammates cannot ignore. From tight in the pocket the skipper takes a step to the side and slots it through. GOAL SAINTSIt is a dream start for St Kilda as Milne kicks his first of the match. BEHIND SAINTSA loose hand pass is snapped up by Dal Santo who runs on and kicks for goal, his shot is wide and through for a point. Welcome to the MCG for the clash between the Demons and the Saints, St Kilda need a win to keep their finals hopes alive while many of the Melbourne players will be playing for their careers.